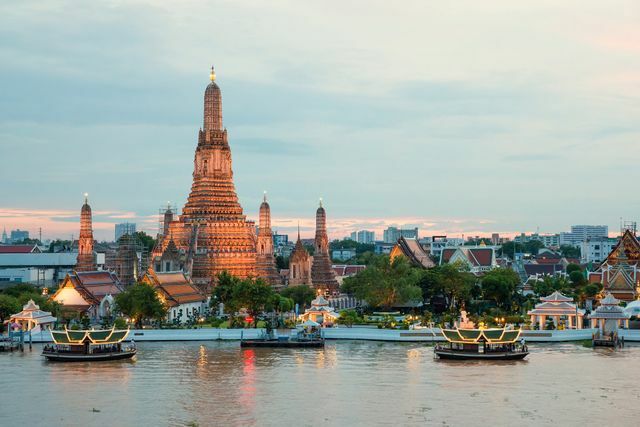 With some of the most Instagram-worthy beaches and most fascinating ancient temples in the world, many newlyweds don’t need much convincing to book a Thailand honeymoon. 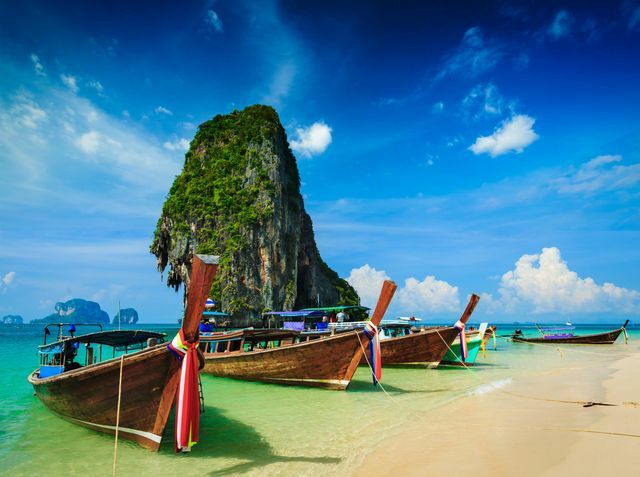 With some of the most Instagram-worthy beaches and most fascinating ancient temples in the world, many newlyweds don’t need much convincing to book a Thailand honeymoon. Regardless if you trek to the Northern part of this remarkable country in Chiang Mai or island hop from Phuket to Koh Samui, there’s a bit of Southeast Asian magic for every couple. Before you hit ‘book’ though, make sure you brush up on the best places to go, when to set sail and of course, gotta-see-sites while you’re on your journey. Here are our top tips for planning your Thailand honeymoon. Truth be told, with nearly idealistic weather year-round, a Thailand honeymoon is a warm choice no matter which month you wed. Even so, the highest - and ahem, most expensive! - time of year to visit this country is between November and February. If you can swing it, try visiting when crowds and rates are lower between July and October, which also happens to be nicknamed the ‘rainy season.’ Though it might pour a bit every day, it’s usually short-lived, meaning you’ll actually savor the cool down. This time of year will offer less expensive resort options, fewer long lines to wait in and other perks. Just make sure to book your excursions beforehand, since there are fewer companies operating during this segment. 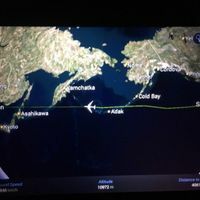 The months of March to June are the hottest, so unless you can take the heat on your Thailand honeymoon, it’s best not to visit during this four-month period. As the original capital before Bangkok took the lead, this digital nomad hub in Northern Thailand is home to hundreds of ancient temples, plenty of breakfast and brunch spots and hiking that takes you to the highest point in the country. Though not as popular as the pretty blue waters of the South, for a Thailand honeymoon, Chiang Mai definitely can’t be missed. Get lost in the Old City that’s surrounded by walls as you explore beautiful temples, sample fare from the nightly markets and buy local arts and goods. For some added romance, stop by one of the countless spas which offer traditional Thai massages for couples at an insanely inexpensive price. Don’t miss this local dish: Khao Soi, a spicy-and-sweet red soup often served with chicken. Less party and more made for romantic celebrations, Koh Samui is one of the smaller and tamer islands for your Thailand honeymoon. For those couples who want to lounge by the pool at their resort, toasting to their marriage with coconuts topped with straws, and then head to a sandy beach party at night, this is the place to see. You’ll not only be relaxed by the ease and the kindness of the Thai people here, but you’ll never forget seeing the impressive light show that’s often performed on the shores as the sun sets. Another spot to witness is the Big Buddha Temple (Wat Phra Yai), which offers a timeless, ageless glimpse into this treasure doctrine. For a chance to get all googly-eyed with your partner, chat with your hotel or research companies online to book a not-to-miss sail on a long tailed boat through waters so blue, you won’t believe their shade. Don’t miss this local dish: Kalamae, a sticky - and super sweet! - candy that’s made of palm sugar, coconut cream and rice flour. When you scroll through photos that are tagged for a Thailand honeymoon on Instagram or Pinterest, chances are high you’ll stumble across an image from this island. 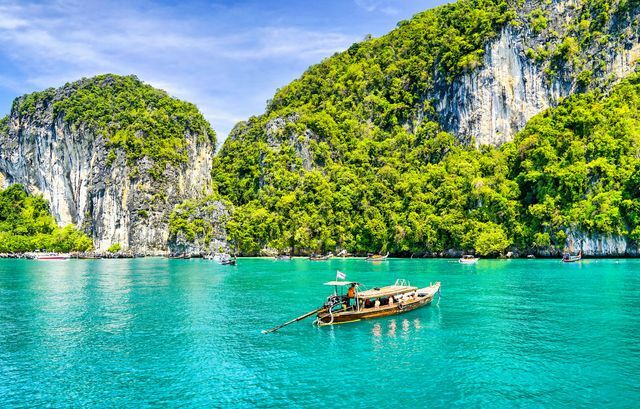 Full of rain forests and mountains perches on the Andaman Sea, Phuket is one of the most popular and sought-after destinations in the whole country. You’ll experience clear, beautiful waters and countless resorts, spas and restaurants to choose for. Though definitely more touristy and pricier than other spots, there’s nothing quite like calling a Tuk-Tuk to get you from point A to point B, as you speed across the sand. Regardless if you venture through Phuket City, Patong or Karon, there’s plenty to experience on this sliver of seaside land. Make sure to book a reservation at one of their many sunset bars, where there’s no shame in stealing a kiss or two to seal in your new marriage. Don’t miss this local dish: Mae Hoon Baa Chaang, stir-fried noodles with soy sauce and spring onions that is served with a pork rib soup. 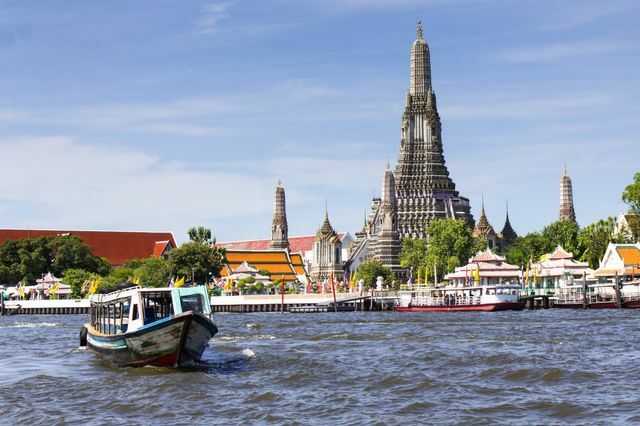 If you have a few days in Bangkok at the beginning or end of your Thailand honeymoon, Bangkok is an interesting experience. As a hectic, exhausting city, you likely won’t need more than 48 hours here, as it won’t provide the relaxation you likely seek from your just-married vacation. Even so, there’s something exhilarating about hitching a ride in shared car service called ‘Red Car’ or bargaining with a local over prices at one of the many floating markets along the water. And of course, the most impressive temple of them all - the Grand Palace - is a must-visit if you’re in the area. For escaping the madness of the streets, find a rooftop restaurant with sprawling views, where you can exhale and dream about your future together. Don’t miss this local dish: Pad Thai, the most infamous of them all is usually sold on the streets, featuring stir-fried rice noodles, bean sprouts, tofu, egg, Chinese chives, sliced banana flowers and shrimp.